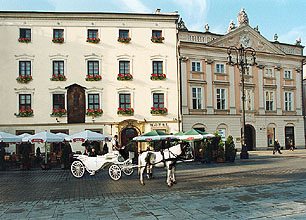 Situated in the central point of Krackow, the Market Square, the Wentzl hotel is housed in beautiful historic tenement house from the 15th century. The house belonged to the Cellarich's family and it was called the house "Under the Painting". The hotel offers comfortable, air conditioned, furnished with style, single and double rooms where guests will relax in a unique climate. Guests will admire the beautiful panorama of the Market Square. Each rooms has direct and free of charge access to the internet. The hotel invites you to renaissance interiors where we serve delicious as well as best wines from all over the world. It is the place where one may try exquisite Havana cigars. It is worthwhile to admire the paintings from the famous collection of Wojciech Fibak "Ăcole de Paris".